About Yoga and being Lost. Is not that I´m coming back over and over to the same subject but what happened is that in the apartment where we stayed in Berlin there was this big comic style poster on the wall that talked about Bataille, the Minotaur, mazes, being lost and the idea that we find ourselves not only because we´re lost but as lost beings. 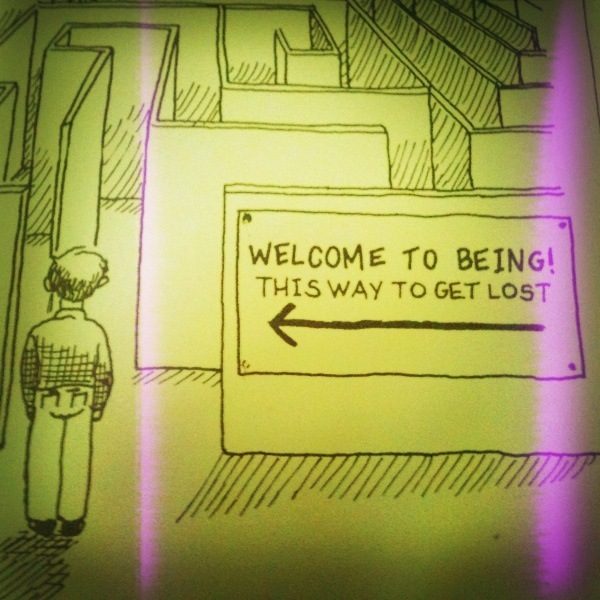 Is not that idea that says that you have to go to unknown places to find yourself, neither that idea that says that, to be able to find yourself, first you have to be lost, Oh no…In this comic/poster the artist expressed the idea that when we start thinking about existence and what / why / how is that we ended up here, we find ourselves only in the feeling of being lost. 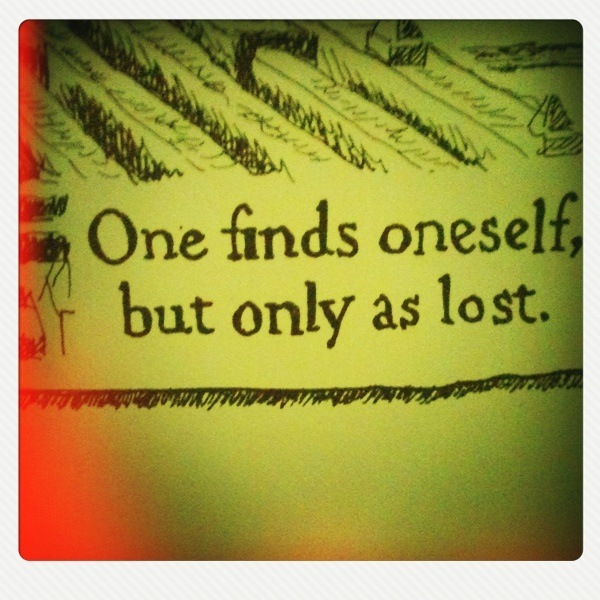 Or, as the comic said: One find oneself, but only as lost. At the beginning, I liked yoga because all the good things we already know: the feeling after each practice, how your body feels, the awareness that brings from outside-in: the doors of sensitivity open and a new world appears in front of you! I liked it because I felt that I was discovering something new, connecting myself with something deeper and –this was very important for me- true. During these days I´ve been experiencing something new: The feeling that, thanks to the yoga practice, I was able to make decisions that changed my life completely, decisions that, in another moment, I never thought I was “brave” enough to take. It seems very clear to me now, that Yoga is a path that opens new paths in front of you. Instead of walking paths that were already there, in some strange way, you begin to walk a path that is only yours, spiritually yours. The people you come across seem to realize this and it´s something of great value. So, the cycle continues because these same people motivate you to go a little further, to follow your intuition, your heartbeat. Is not that you will get somewhere, that´s not the important part. The sensibility translates into independency, freedom, inner strength. I feel really grateful to yoga –and the people around me- because of this. 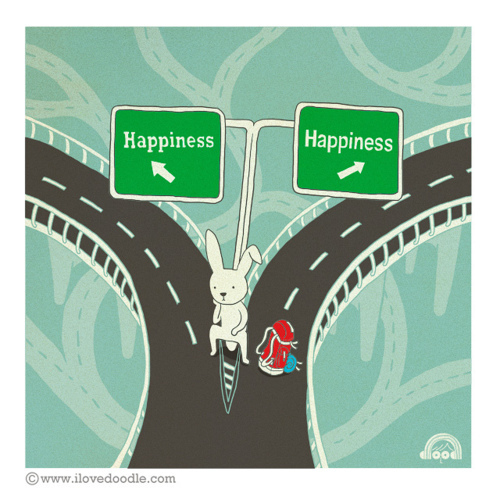 When I started walking it, it seemed like one big path only: “YOGA”. In this moment, it´s more like that labyrinth I saw in Berlin. And I see myself there, where many roads intersect. Not lost -because one can be lost only if you have a place to go- but alive. qué bonito! le tomé fotos a todo es comic para leerlo con calma porque nunca tuve tiempo. tqe quiero alejita! Es weno weno! 🙂 Te quiero también! Previous Previous post: Spirits, family and photos. Next Next post: Sunny happiness.